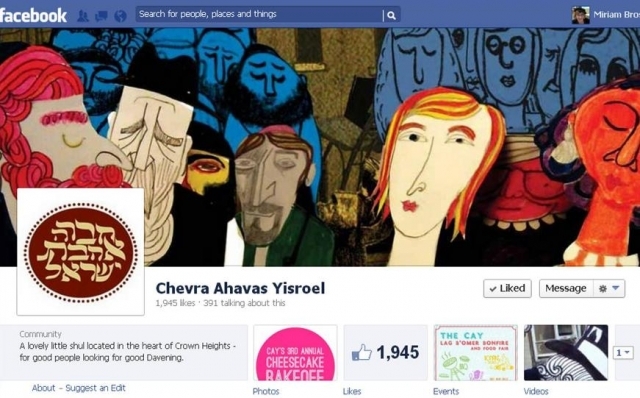 Chevra Ahavas Yisroel, a Lubavitch synagogue in Crown Heights, “does Facebook” better than any congregation I’ve ever seen. * The numbers aren’t the real success story here, but for the record, they have nearly 2,000 likes, with a few hundred folks “talking about this” at any one time. Their posts get consistent engagement. And, to the best of my knowledge, their efforts online are paying off; it helps strengthen the community, raise dollars, and keep CAY at the top of their congregants’ minds as often as humanly possible. Ok, see what I mean? This is their fabulous header image – done by an artist in the community, OF the community. It literally and figuratively represents what (or rather who) they’re all about. CAY says thank you. A lot. And genuinely. A good habit for anyone to develop. Also, CAY members are regularly sharing life-cycle events, and each one of them is diligently posted to the Page. But, more than that, the Chevra Page adds a little something special to each one, pointing out the special qualities of the people involved. CAY makes a special effort to regularly highlight members of the community and show how unique and valuable they are. Check back on the header image and look at the description of the shul. Read the posts I’ve included as screenshots here. Getting an idea of the personality of the shul? What the leadership might be like? What it might feel like to pray there? Yup. That’s the point. Go for that. The posts regularly include a lot of goofy, fun, gentle humor. The shot below is so, so much better than the multitude of posts I see from congregations everywhere saying, “Come to this event! It’s going to be great.” Oy. Find your style and let it shine! CAY’s posts are also super honest. They ask for help. They admit when they’re struggling with something. It’s a great example of authenticity breeding engagement and building community. CAY uses lots of images and video, both of which are great windows into the community, but are also very friendly to the Facebook Newsfeed algorithm, Edgerank. It helps keep them and everything they stand for at the top of their congregants’ minds as often as possible. They post regularly, but not overwhelmingly so. There’s always meaningful activity happening on the Page. They excel at responsiveness. The Page manager jumps in on conversations and offers genuine answers in a timely way. In addition, rebbetzin especially makes a point of chiming in on posts as herself, and sharing info from the Page to her personal profile. The Page is part of a broader communication ecosystem; it doesn’t stand alone. CAY uses Facebook’s Promoted Posts and other ad services to remind folks about events and other important happenings in the community. Notably, they always is use paid promotion to accelerate good content, not to prop up content that’s flailing. Which of these points resonates most with you? Which does your Page do well, and which can you work on? *Point of clarification – CAY is NOT a Chabad House. It is a shul by and for (almost entirely) Lubavitcher Hasidim, though it’s run much like a Chabad House. It's the start of a new Religious School year and you want to do something to start the year with a bang. It would be good to find a way to help parents and children meet the teachers right away. And it's always nice to use new technology to show that the synagogue is moving with the times. These were some of the aims as we embarked on a new project at The Community Synagogue. It was on the Darim Social Media Success Stories webinar series that I saw the way that Rabbi Rebecca Milder had used social media and QR codes for displaying the work of their students. It got me thinking about the ways that we could use QR codes in our own synagogue community. The idea was to record videos of all of our teachers with a welcome message to the new students introducing themselves and sharing their excitement for the forthcoming school year. These videos would be available through our website. But the primary way in which we intended to share them was via posters in the lobby of the synagogue, with QR codes linking to all of the videos. We registered with www.qrstuff.com as I had seen them recommended by Rabbi David Gerber on another Darim webinar. For a small fee this service provided us with analytics for each code we created and also gave us the potential to subsequently change the web page to which the QR Code was linked. Next came the videos. Teachers who were technologically able filmed their own and the rest we recorded using iPhones. While I am sure we could have made better quality recordings with a more sophisticated camera, for the short 20-30 second clips the iPhone was sufficient. All of the clips were uploaded to YouTube and filed as 'unlisted' so that there was some degree of privacy. We then embedded all of the videos onto individual pages on our website, so that the QR codes would direct people to our website rather than YouTube. By the first day of Religious School we had 31 videos, all but one of our teachers was happy to be a part of the project. Each teacher had their own section on a poster which included their picture, the classes they were teaching and the QR code to watch their video. These were mounted together onto 6 poster boards and displayed in the synagogue lobby as people made their way into the sanctuary for the opening of school. We also printed out a few sheets with information on how to use QR codes and to download a QR scanner. There was one line to register new students and there was another line to scan the codes and watch the welcome videos, with a real sense of excitement about the new display. It was great to watch as parents and children met their teachers 'virtually' before meeting in person later that morning. We've continued to display the boards in the lobby to give people further opportunities to scan the codes and watch the videos. We have had well over 100 scans of the QR codes by parents and children of the synagogue, and it's been a great way for the community to get to know one another. Part of the Connected Congregations series. 1983. The author was in Atlanta, GA serving in his first full time Rabbi / Jewish Educator position. As part of a synagogue renovation project, the synagogue’s school building (which once served as the state’s Ku Klux Klan headquarters!) was being restored after having been abandoned years earlier. The synagogue had been founded in the city of Atlanta. In 1946, it followed the move of Jews to suburbia. Consistent with the architecture of the time, the bima was an elevated stage several feet above congregant seating and positioned several yards forward from the front row of seating. The bima was illuminated by several spotlights, which easily raised the temperature to 10 degrees higher than that in the seats below. Today’s American synagogue model grew up in the post World War II era. The architecture of synagogues moved the attention from the center of the synagogue to the front, reflecting the idea that the “action” was going to take place on a stage, with paid lead actors (rabbi, cantor) performing from in front of and above the congregation, who would be participants, not leaders. At the same time, the economic model of the synagogue was built on membership dues, which in turn relied on Bar/Bat Mitzvah, which in turn relied on synagogue “religious schools” to provide the financial means of keeping synagogues going (which also devalued both the educational program and the Bar/Bat Mitzvah). Fast forward to 2012, and the (Jewish) world has changed, and the relationship of Rabbi to Community Member has changed with it. Today, only a fraction of Jews look to their rabbi as a sole authority on their spiritual or religious life and practice. I propose that the model for the Rabbi / Community Member relationship must change to that of a Coach / Client relationship. In that relationship, the rabbi still is the scholar, but his/her role is not to try to impose one particular type of Jewish practice, as much as to set out options for people, and then empower them to set their Jewish life paths. Rabbinic training needs to continue a move that has already progressed away from growing rabbis as authority figures and towards growing rabbis as coaches or spiritual mentors. Conversations between rabbis and community members sound more like “here are some possibilities that Judaism provides for your life” rather than “this is what Judaism demands of you”. Synagogue services must loosen up and move the “action” back to the Jews in the Pews rather than on the frontal bima. Among the ways to make that happen are interactive text studies during services, Storahtelling type theatre to supplement Torah reading, even Tweetups during services for those congregations that permit use of technology on Shabbat. Congregations and their rabbis need to not be limited by physical walls or by the walls of membership. There is an economic challenge to opening the doors, and some very creative communities are already trying to figure out how to keep congregations viable as these changes occur. But as the Jewish world has seen from examples such as Sukkah City and Dawn. To use Rabbi Rick Jacobs’ expression, we must break down the synagogue’s walls. Community members and rabbis need to talk to one another. It’s no longer good enough to have families on membership lists that rabbis only talk to on holidays or when there is a life cycle event. Rabbis need to have conversations with each family or individual during the year that say “How can I or Judaism be of service to you in your life?” And the meetings don’t have to be in the “rabbi’s study”. They can be at Starbucks or over a corned beef sandwich at a deli [that’s right, we like a good corned beef sandwich, too]. How will your rabbis and your community members join in leading change? Rabbi Arnold D. Samlan, MSW, is Founder and Owner of Jewish Connectivity. Arnie is an innovative and creative Jewish educational leader and rabbi. His programs and teachings have powerfully impacted Jewish learners and professionals across the country. A native of Chicago, he now lives in Long Island, NY. Arnie blogs as The Notorious R.A.V., and has a Twitter feed with over 700 followers, @jewishconnectiv. You can learn more about him and read recommendations on LinkedIn.